I mentioned the possibility of these new features last week, so I'll try to make this as short as possible. The "Writings" section now functions similar to the "Portfolios" section. Hovering over the text will produce a drop down menu with various choices; "All" will direct you to all of my writings, "Poems" will direct you to, yes, you guessed it, poems, and "Index" will bring you to both a month and tag index of all of my posted writings. This setup allows me to maintain the current design and function of the website, while adding categories and indexes outside of the somewhat buried footnote of each post. Enjoy and please feel free to let me know what you think! I thought I'd provide a quick update on some of the new features on the website, as well as some of the features you can expect in the coming weeks. Most of this pertains to the "Writings" section, in an effort to improve navigation and encourage browsing within it. But first, if any of you were unaware or holding back for this reason, I wanted to quickly note that the "Share," "Comment," and "Like" buttons at the bottom of each post can be used without the annoyance of creating an account. So please, click away! Secondly and perhaps most notably, at the bottom of every post in this section, there are now categories and tags. For example, this post says "In updates." The word "updates" is a clickable category and clicking it will show all posts that are updates about the website or my various adventures. This post also says "Tags website." The word "website" is a clickable tag that will bring up all posts that are tagged with "website." Some posts will have many tags, for example, the "Back from All Good" post. Finally, to make these features even more useful, I am speaking with the folks who helped design my website about adding a sidebar to the blog. Ideally, I want to add month, category, and tag indexes without having to change the beautiful center layout of the entire site. In relation to this, please let me know if you would like to see any other features added, or if you have noticed any problems and/or bugs when navigating the website. Thanks and enjoy! Looking back towards the hill, All Good Music Festival, July 18th, 2013. As some of you might have already noticed, I uploaded a batch of photographs from the All Good Music Festival this morning. The subjects include John Scofield, Yonder Mountain String Band, and members of Furthur including Phil Lesh and Bob Weir. Enjoy the extra photos while you can because, like before, I will most likely thin out the portfolio in the near future. In addition, I will be adding some shots from other concerts I have attended. Finally, for obvious reasons, all concert shots will be watermarked; if you would like to use any of these photographs in your publication or on your website, I ask that you please contact me first. I will happily provide an unwatermarked version, so long as I still receive credit for the work. Thank you and enjoy the photos! 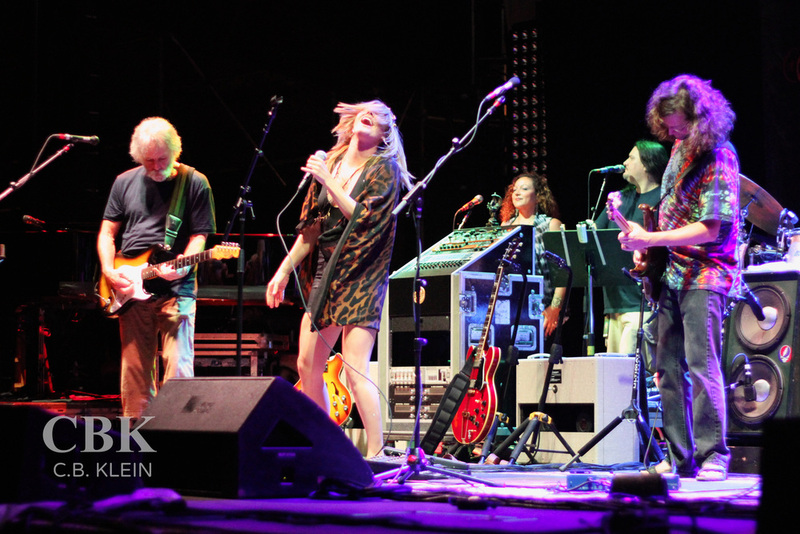 Grace Potter performing "Turn on Your Lovelight" with Furthur, All Good Music Festival, July 20th, 2013. For those of you who don't know, I spent the past four days as a member of the camera crew at the 2013 All Good Music Festival and Campout. (For those of you who met me there, my photographs will be posted to this website in the coming days.) In short, shooting and filming the festival was an absolutely incredible experience. I'm slowly getting the sense that it was both the conclusion of one incredible part of my life, as well as the beginning of what should be another spectacular stretch. Along with some persistent effort, I could do great things as a result of the photographs I took and the people I met. There are moments from the last few days that I will never forget, and more importantly, I will never be able to thank my friend (Sam Shouvlin) enough for providing me with such an opportunity. It truly was one of the greatest weekends of my life. Anyways, I'll stop waxing poetic for now, but keep posted for a new "All Good" photo album in the "portfolios" section in the coming days. Following a week's worth of work with aesthetics and the overall feel/function of the website, I've finally uploaded a few portfolios. Currently, the portfolios are classified as "Deserts," "Forests," "Mountains," and "Oceans." These portfolios will most likely shrink in the near future, so enjoy the extra photographs while you can! In addition, keep an eye out for new portfolios and photographs, rotating featured photos on the non-portfolio sections of the website, and new poems (coming soon in this section). Finally, feel free to contact me with any feedback regarding the portfolios and the general functioning of the site; any and all help is greatly appreciated. Correct you are! Indeed! Right-o! Yes, I've finally managed to create a website. While it's still in the earliest of stages, you can get an idea of what I'm aiming for. The "portfolios" section will showcase a variety of my photography, organized by general environments rather than specific places or times. The "writings" will include periodic posts on my travels, recent work and other musings including poems and quasi-philosophical ramblings. The "about" and "contact" sections are pretty self-explanatory. So get excited and stay tuned in the coming weeks as I upload my portfolios, poems and thoughts!